A recent series of articles about Palestinian-American political activist Linda Sarsour startled many in feminist and Jewish circles, me being one of them. In these articles, Sarsour states that feminism and Zionism are incompatible. I don’t know that I am even the authority to speak to this on an international level, but here’s what I have on a personal level. Feelings. Zionism is the belief in the right of the Jewish people to have an autonomous state in Israel. I am a Zionist. Feminism is the belief that a woman-driven movement can bring about race, class and gender equality and that women deserve all of the rights and privileges afforded to men. I am a feminist. There are Zionists who are critical of certain Israeli policies and those who are not; there are Zionists who are anti-occupation and there are Zionists who are pro-settlement; and there are Zionists who fall between these extremes. The definitions of Zionism and feminism are not in conflict with each other. At all. Alan Dershowitz: Why Must Women Choose between Feminism and Zionism, but Not Other “Isms”? There are many countries and movements throughout the world that treat women as second-class citizens: Israel is not among them…. There is a word for applying a double standard to Jews. That word is anti-Semitism. If Sarsour was concerned with addressing structural causes of all female oppression, she would mention the status of women in the PA-controlled West Bank where just a few months ago the names and photos of female candidates for the municipal elections were omitted, referring to the women instead as “wife of” or “sister of.” Sarsour would also call out the Hamas-controlled Gaza Strip, where the police are a law unto themselves who act as judge, jury and executioner of those who speak out against their oppression and misogyny. She would condemn the tolerance, if not acceptance, by so many Muslim countries of the “honor killings” and genital mutilation of women. Instead the IWS platform exploits the feminist cause in order to delegitimize and demonize only one nation: that of the Jewish people. The real choice to be made now by all those who care about the feminist cause is whether to allow Sarsour and her radical anti-Israel allies to hijack the movement in support of their own bigoted views. The alternative is to maintain feminism’s focus on key issues that pertain to women and to call out countries and movements according to how seriously they violate women’s rights, rather than singling out the one Jewish democracy – Israel. Prof. Phyllis Chesler: Does UJA have a problem with my opinions? I was disinvited, after the invitations with my name were sent out, to a UJA event at which I was to be an honoree. Perhaps political correctness trumps my fight for women. It certainly trumps free speech. But really, what could possibly have changed from March 7th to March 15th? Is it, perhaps, something I wrote? On March 8th, an interview with me about the Woman’s Marches, faux-feminism, and Linda Sarsour appeared in the Algemeiner and on March 9th, another interview with me on the same subject appeared at Breitbart, Jerusalem. On March 13th, I published a piece at Israel National Newsin which I criticized the articles written by Letty Cottin Pogrebin (3/8, in Ha’aretz) and Peter Beinart (3/9 at the Forward). Did my appearance in Breitbart outrage some donors? Or, is it what I wrote in Israel National News where I critiqued the views of Pogrebin and Beinart, two darlings of the left-wing Democratic Party, stalwarts of J Street and the New Israel Fund, etc., that was a final straw? I may never really know. I reached out to Anne many hours ago to stand with me in solidarity. Her mother is planning to come and it’s a “Go” for her. In other cases, J Street tries to have it both ways. Regarding Hamas, a J Street policy paper notes that the group “has consistently condemned Hamas for calling for Israel’s destruction,” but in the next paragraph makes the case for why Hamas must be engaged. “[O]ne makes peace with one’s enemies not one’s friends,” the paper says. “There has to be a channel of dialogue with Hamas,” Ben-Ami said during a 2010 Georgetown University program that J Street co-sponsored with the Muslim Public Affairs Committee (MPAC). Its 2012 J Street Conference, for example, featured a panel discussion with leading BDS advocate Mustafa Barghouti. He was not challenged about BDS, and his insistence that any future peace agreement between Israelis and Palestinians include a “right of return,” which could end Israel’s Jewish majority, also went unchallenged. In another discussion at the same conference, Barghouti described Israel as an apartheid state. He also made brief references to BDS, which also drew no pushback. In general, J Street’s “pro-Israel” agenda places the blame for the ongoing conflict on Israel’s shoulders and demands more of it than of Palestinians. When it brings itself to condemn Palestinian incitement, it engages in moral equivalence, also mentioning rare instances of Israeli violence against Palestinians. The dossier also studies J Street’s financial support, political activity and more. To read the full dossier, click here. However, the crass political exploitation of their Jewish identity by American leaders of purportedly “nonpartisan” mainstream Jewish organizations is unprecedented. Today, in what must be described as self-destruction, a substantial number of irresponsible leaders of the most successful and powerful Jewish Diaspora community seem to have gone berserk, and are fueling antisemitism. Nobody suggests that Jews should not be entitled, like all American citizens, to engage in political activity of their choice. As individuals, they may support or bitterly criticize their newly elected president – but as leaders of mainstream religious and communal organizations they are obliged, as in the past, to assiduously avoid being perceived as promoting partisan political positions. What has taken place in leading mainstream American Jewish organizations during and since the elections can only be described as a self-induced collective breakdown. What might have been regarded as a temporary aberration has in fact intensified in recent weeks. Let us set aside the fact that many of these liberal Jewish organizations have also distanced themselves from or even abandoned Israel. They have done so even though the Trump administration has the potential to restore the US-Israel alliance that president Barack Obama undermined in a vain effort to appease Muslims. It is also clear that, for many assimilated liberal Jews, Israel is no longer a priority, especially now that President Donald Trump has signaled his intentions to renew the alliance. The facts are that liberal Jewish leaders have declared a hysterical war against the Trump administration. A thousand rabbis sign a petition to bring refugees from Jew hating backgrounds into America. Communal bodies kept liquid by Jewish money embrace groups that exclude Jews of the wrong type. Jewish leftists fill a BDS event to hear the Holocaust confused with thriving self-governing Palestinians. The counter-intuitive Jewish mind is an ancient marvel. Who knows that better than the Almighty. In one breath the Jews are warned against carving graven images, next they are instructed to carve graven images for a tabernacle that will contain the Almighty. It must be in the Jewish DNA to be contrariwise. Are the rabbis and communal bodies and BDS clique being contrary? Is there smart logic buried in their paradoxical ways, if one could only figure and ferret out their logic? The Jews that find common cause with anti-Semitic movements – do they know something we don’t? Are we the dumbos? Why didn’t Gorka simply tell this to The Forward? A source close to the White House, who was briefed on how the administration treated this story, explained things a little more to me. If you’ve been following the Gorka story—The Forward’s accusation is hardly the first attempt to portray the aide as a bona fide Nazi—here’s what you know. Gorka’s father, Paul, was a dedicated member of the anti-Communist underground, and had risked his life to organize the Hungarian resistance and deliver vital information about the Soviets to western intelligence agencies, including the MI6. He was eventually arrested, badly tortured, spent two years in solitary confinement and some more in forced labor in the coal mines before eventually escaping to England. Understandably, Gorka Jr. was deeply moved by his father’s dedication. It’s why, for example, he wore his father’s Vitézi Rend medal to President Trump’s inauguration. You may find this kind of devotion to be overly doting or even creepy, but if you’re being honest, the story here is simple and in some ways touching. On November 10, 1938, 16-year-old Gertrude Rothschild was recruited by her rabbi to hurriedly enter the ruins of their synagogue in Konstanz am Bodensee to help gather up and bury the burned remains of their Torah scrolls, all that remained after the infamous night of violence, Kristallnacht. The story remained etched in Gertrude’s memory. She later survived the Gurs concentration camp, in Vichy, France. Gertrude understood why people burned synagogues. Decades later, she embedded the memories of Kristallnacht in the minds of her children and grandchildren, one of whom is a co-author of this piece. We all knew from an early age that when a synagogue was attacked, the core of our Jewishness was defiled and threatened. Post-World War II Germans understand this fact and have acted accordingly when such anti-Semitism reared its ugly head. That is, until the court in Wuppertal. We don’t have the courage to tell Gertrude, now in her nineties, that those blacked-robe judges (and the regional court that later confirmed the ruling), decided that three Muslims who set fire to a German synagogue were making a political protest against Israel’s actions in the Gaza War, and therefore could not be convicted of anti-Semitism. If German history isn’t sufficient a guide, a definition of anti-Semitism has been adopted by 31 European nations, and should guide German jurisprudence in erasing this travesty. But the stain and pain remain. As Harvard professor Alan Dershowitz put it, “The idea that attacking a synagogue can be justified as an anti-Israel political protest, rather than anti-Jewish hate act, is as absurd as saying that Kristallnacht was merely a protest against poor service by Jewish store owners.” Or, we might add, claiming that torching a mosque is a protest against ISIS. Or dismissing the desecration of the Cologne Cathedral as a consequence of long-simmering discontent over the medieval Crusades. Jewish community centers in three states were hit with bomb threats between Tuesday night and Wednesday morning, with at least two coming via email. All were deemed to be non-credible. JCCs in St. Louis, Atlanta, and Boulder, Colorado received the threats, according to local news reports. The threats in St. Louis and Boulder came via email; Atlanta’s JCC would not comment on the nature of the threat. All three JCCs had received bomb threats this year. The scares are the latest of nearly 150 bomb threats to hit JCCs, Jewish day schools and other Jewish institutions since the beginning of the year. The threats have mostly come in waves, via phone and email. Many of the institutions have been threatened more than once. The investigative journalism nonprofit ProPublica has produced an interactive map that chronicles over 150 antisemitic crimes across the United States from the past few months. The graphic, which was published Wednesday, is a companion to an article ProPublica ran last week, “In an Angry and Fearful Nation, an Outbreak of Anti-Semitism,” which found evidence of over 330 incidents of antisemitism between last November and early February. The interactive map links each pin to local news reports from across the country, allowing users to access the original news stories for each instance of antisemitism. Most of the incidents involve vandalism, such as spray-painted swastikas and other defacement of public spaces. A historian and a linguist expose the ideas, codes and figures of speech that communicate antisemitism in the 21st century. Reporting on the results of a study that extracted expressions of antisemitism from more than 15,000 letters, emails and faxes that have been addressed to the Council of Jews in Germany and to Israeli embassies all over Europe, Inside the Antisemitic Mind exposes the ideas, codes and figures of speech that communicate antisemitism in the 21st century. The investigation shows how traditional antisemitic themes such as the blood libel, the idea of Jewish moral inferiority or the idea that Jews are money-grubbing usurers are transformed into interpretations of contemporary sociopolitical developments, such as the 2008 global financial crisis or the Middle East conflict. Senior members of the Foreign Ministry made their way to Buenos Aires on Wednesday evening for a series of events commemorating the 25th anniversary of a deadly terror attack on the Israeli embassy there. Foreign Ministry director-general Yuval Rotem and Modi Ephraim, the deputy director-general for Latin America, are leading the Israeli delegation, which also includes family members of Israelis killed in the 1992 attack. They are scheduled to meet with senior politicians, including President Mauricio Macri and Buenos Aires Mayor Horacio Rodríguez Larreta. On March 17, 1992, a suicide bomber killed 29 and wounded hundreds in front of the Israeli embassy in Buenos Aires, in what still is the deadliest attack on an Israeli diplomatic mission. A group with ties to Iran and the Lebanese terrorist group Hezbollah took responsibility for the bombing. Cornel West favors free speech, unless it is on the subject of Israel. Cornel West, Professor of the Practice of Public Philosophy at Harvard Divinity School, is, whatever one thinks of him, among the biggest names in American intellectual life. It was, therefore, a coup when he put himself, with Princeton’s Robert George, at the head of a statement articulating the principle of free thought and expression, particularly at colleges and universities. The statement arises in response to the shouting down (and worse) of Charles Murray at Middlebury College, about which I have written here. Last week, the Republican-led New York State Senate passed its own anti-boycott law by an overwhelming 49-11 majority. The bill seeks to withhold state funding from any student group that engages in hate speech, or calls for a boycott of Israel or other “allied nations.” The bill will now move to the State Assembly, where it is anticipated to encounter opposition. Another recent victory against BDS came at Ohio State University (OSU), where a pro-BDS referendum was narrowly defeated by a vote of 4,084-3,843. Also last week, Christian Imark — a member of the conservative Swiss People’s Party and the deputy leader of the the lower chamber of Switzerland’s legislature — introduced a groundbreaking anti-BDS bill that passed by a vote of 111-78. The legislation seeks to halt government funding for organizations that support BDS. The bill must now clear the legislature’s upper chamber, the Council of States, before it can be enacted into law. Long admired in pro-Israel circles for his 2003 book The Case for Israel, former Harvard Law School professor Alan Dershowitz is now targeting the anti-Israel Boycott, Divestment and Sanctions (BDS) movement. More than 250 people, representing a variety of Jewish and pro-Israel advocacy groups, gathered from the March 4-6 “Combating the Boycott Movement Against Israel” conference in Los Angeles. They met to exchange ideas and strategize in the face of BDS’ multifaceted threat against Israel. StandWithUs has now hosted this annual anti-BDS summit for three years, which it describes as the first large-scale national conference devoted exclusively to the issue of tackling BDS. Frankfurt Mayor Uwe Becker hammered a pro-Palestinian group on Monday and Wednesday for promoting a Nazi-style boycott against Israel and told a local center to cancel a June event with the organization. Becker announced on Wednesday that he plans to stage a protest against the Kopi event in front of its location in June, according to a report in the Rundschau. The anti-Israel event, titled “50 Years of Israeli Occupation,” is slated to take place at the Ka Eins Conference Center in Frankfurt on June 9 and 10. Becker is a member of Chancellor Angela Merkel’s Christian Democratic Union Party. 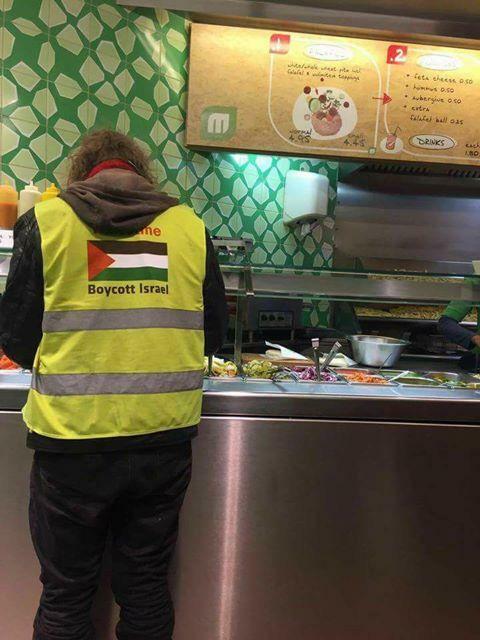 An anti-Israel activist seen to be promoting boycotts was spotted buying his falafel lunch at the Israeli chain Maoz, in Amsterdam. 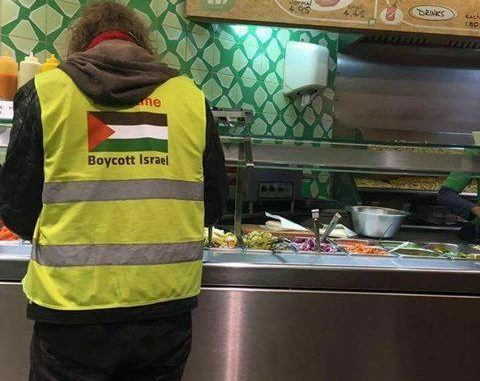 The man dressed in a high visibility vest, with the Palestinian flag and the words “Boycott Israel” written in bold, was pictured filling up on salad for his falafel. The picture caused amusement on a Dutch Jewish news Facebook page, where people have been quick to point out the irony. The Maoz chain was founded by Israeli husband and wife Nahman Milo and Sima Bar-On. According to the chain’s website customers have the pick of two main items, the Maoz Falafel Sandwich and the Maoz Falafel Salad Box. The messages appeared on the site’s home page for about three hours Tuesday, according to local reports. The West Bloomfield Police Department is investigating and could involve the FBI, according to reports. Thousands of walkers, Jews and non-Jews, participate in the march, which is marking its 12th year. Andre Douville, CEO of the Walk for Israel, told the CBS affiliate in Detroit that he began getting phone calls at around noon Tuesday telling him there was a problem with the website. Another act of anti-Semitism in our local community, the oh so tolerant and inclusive Bay Area. A student at UC Hastings reported his mezuzah on the doorframe of his McAllister Tower campus housing had been set on fire. It is being investigated as an anti-Semitic hate crime. Malaysia, how about visas for Israelis? As demonstrated by the February 13 public murder of Kim Jong-nam, the estranged half brother of North Korea’s ruler Kim Jong-un, the regime in Pyongyang continues with its tradition of ordering killings of those who it views as a threat to its power. This hit job is part and parcel of the regime’s sponsoring of various crimes beyond its own shores over the years for purposes of raising hard currency and protecting its power. A few examples of this nefarious behavior are kidnappings of Japanese nationals during the 1970s and 1980s; the 1983 Rangoon bombing and attempted assassination of South Korean president Chun Doo-hwan; the production and sale of illegal drugs and imitation goods; human trafficking; arms proliferation; and counterfeiting currency. In light of this, Malaysia’s March 2 announcement of the scrapping of its visafree entry for North Korean nationals is a wise policy reversal and a step in the right direction toward public safety and security in the country. Yet, the recent fallout between Malaysia and North Korea over Kim Jong-nam’s murder ought to spur in Malaysia a reevaluation of its stance and policies toward Israel. For decades, Malaysia has forbidden Israeli passport holders from entering the country. Mr Harwood, who is not Jewish, noted that despite land disputes and human rights abuses in countries including Pakistan, Saudi Arabia, Yemen and Syria, “the only one that the NUS seems to relentlessly bang on about is Israel. If he were elected, he said, he “wouldn’t want the NUS to be getting involved in foreign policy at all, one way or the other. I don’t think it’s NUS’s place to do it”. “If you want to run a Palestinian liberation campaign – fine – but don’t pretend that you’re representing all the students when you do it. The most cursory glance at Mr Moodey’s Twitter page indicates just how one tiny sliver of a country in the Middle East, that belonging to da Joos, tends to occupy his thoughts, and not in a pleasant way. He’s also got his boxer shorts in a twist over definitions of antisemitism, ventilating his views in a letter to a Church of England newspaper (image on Twitter: the letter, that is, not the boxer shorts). The most recent (at the time I type this) tweet of his relates to Stephen Sizer, whom he’s always prone to defend. That tweet’s similar to what Mr Moodey’s posted on Facebook (at right). Only the tweet lacks the readers’ comments which, though not without challenge from fair-minded folk, trivialise and at least on the part of one Sizer fan, actually deny that the vicar ever linked to that notorious “Israel did 9/11” article in the first place! This week saw a new milestone for Israel’s economy, as an Israeli start-up, Mobileye, was bought for $15.3 billion dollars by Intel, marking the largest ever deal for an Israeli company. It is hard to overstate the significance of the deal; the $1 billion sale of Israeli company Waze to Google in 2013 was considered a landmark moment, but that now looks like small fry compared to the Mobileye sale. As venture capitalist Michael Eisenberg wrote, this deal changes expectations and raises the bar, as Israeli entrepreneurs “now know they can build a $15 billion company in ten years.” Israel’s GDP is around $320 billion, so for two Israelis to create a company worth $15 billion, 5% of the country’s GDP, in just ten years, is simply staggering. This very significant story was not reported in the Guardian. This in and of itself is a little surprising, but not malicious or improper. What makes it noteworthy is that the pages of the Guardian feature much discussion and reporting about BDS, the Boycott, Divestment and Sanctions movement – but one wonders whether they are missing the real story. “Brian Eno refuses to let Israeli dance company use his music,” read a Guardian headline in September 2016. Is the decision of one British producer, with negligible economic impact, a more significant story than the multibillion dollar sale of the leading automotive technology company to the world’s largest chip producer? The Guardian features articles on Israel’s actions to counter the BDS movement, articles celebrating BDS successes, as well as opinion pieces discussing the merits and shortcomings of the movement. Is BDS the real story? Surely the real stories of Israel’s economy are the technology start-ups revolutionising every sector, from medical treatment to the “gig economy”, to cybersecurity. Staying up to date with the latest Israeli successes (were the Guardian to be interested in it) would actually be dizzying. One can find successes at every turn – this past September, Payoneer, an Israeli company revolutionising online payments raised $180 million in their latest funding round. In July 2016, a Chinese company bought Playtika, an Israeli gaming company, for $4.4 billion. In the chip-making sector, Mellanox bought Israeli company EZChip in February 2016 for $811 million. BBC Watch submitted a follow-up complaint, clarifying that while Hamas is indeed not part of the “diplomatic process” as it is not part of the Palestinian Authority or the PLO, it did receive more votes than any other party in the 2006 PLC election and hence is clearly a ‘leader’ as far as Palestinian public opinion is concerned. We also clarified that the requirement to recognise Israel as the Jewish state as part of the concept of two states for two peoples is not confined to the Israeli prime minister. “We appreciate that you felt strongly enough to write to us again. We have noted your points and are sorry to learn you were not satisfied with our earlier response. As we see, the BBC does not think that leading audiences to believe that there is one, united Palestinian leadership which regards the two-state solution as its “goal” (while airbrushing from view a proscribed terror organisation that aims to wipe Israel off the map) is a “significant issue” which is liable to hamper understanding of this particular ‘international issue‘. Google has recently started implementing new measures to flag down “offensive or upsetting” content appearing on the search engine, The Guardian reported on Wednesday. The main measure Google has taken to using is the employment of a group of 10,000 independent contractors, who have been described by the company as “quality raters” whose role is to assess the quality of the search engine’s systems. The contractors are tasked with making Google searches based on real queries, and are then asked to score the results based on whether or not they meet the needs of users. While the company started using the contractors’ service back in 2013, the group has recently significantly expanded and a new element has been introduced to their activity- the aforementioned “upsetting-offensive” mark, officially updated on Tuesday. According to The Guardian, one of the main reasons Google was prompted to carry out this initiative was a wave of complaints and criticism that was aimed at the company after publications such as The Guardian and The Observer published a series of articles revealing that queries such as “Did the Holocaust happen” led users of the search engine to top results suggesting misinformation, propaganda and hate speech. France’s far-right National Front suspended a regional official on Wednesday after reports he had played down the Holocaust, dealing a setback to Marine Le Pen’s attempts to sanitize her party’s image weeks before a presidential election. The C8 channel said it had secretly recorded Benoit Loeuillet, a National Front regional councillor in the southern region of Provence-Alpes-Cote d’Azur, using a hidden camera for a documentary about the party being screened on Wednesday. “There was no mass murder as has been said,” Loeuillet was quoted as telling the undercover reporter in an advance extract of the documentary, referring to the deaths of six million Jews in the Holocaust. Loeuillet denied in a statement on Facebook that he had in any way questioned the reality of the Holocaust and said he had asked his lawyer to sue the documentary-makers for libel. He also said he was resigning from the National Front. National Front Secretary-General Nicolas Bay had earlier said in a statement that, as a result of his reported comments, Loeuillet had been suspended from the National Front and would be called very soon to a disciplinary hearing to be expelled from the party. A senior IOC member strongly opposed barring Russia from next year’s Winter Olympics over its doping record on Thursday, comparing a blanket ban to the Holocaust. World winter sports chief Gian Franco Kasper, an International Olympic Committee executive board member, said it was unfair to punish athletes on the basis of their nationality. Concerns have been growing that Russia is yet to clean up its act after a report commissioned by the World Anti-Doping Agency (WADA) uncovered systematic, state-sponsored doping, notably at the 2014 Sochi Winter Olympics. “I’m just against bans or sanctioning of innocent people,” Kasper said, on the sidelines of an IOC executive board meeting in Pyeongchang, venue for next year’s Winter Games. Young families in South Korea and China will now be able to access HIPPY (Home Instruction for Parents and Preschool Youngsters), an Israeli-developed early learning program already reaching 20,000 families at 440 program sites in countries including Argentina, Australia, Austria, Canada, Germany, Israel, Liberia, New Zealand, and the United States. HIPPY partners with parents to prepare kids for success in school, particularly targeting children disadvantaged by poverty, limited education, and language deficits. HIPPY peer educators from the local community make home visits to provide 30 weeks per year of culturally and linguistically relevant curriculum activities and books directly to parents. HIPPY was developed in 1969 by Dr. Avima D. Lombard, a researcher at the NCJW Research Institute for Innovation in Education at The Hebrew University of Jerusalem. Lombard started an early-education program in Israel that aimed to teach parents with limited formal education to be their children’s first teachers for better future success in school. Research has shown that children who participated in the HIPPY program at age three, four, or five appear to benefit long-term in their scholastic achievement. Expansion to South Korea and China was facilitated by an agreement signed by Hebrew University with China’s Award Scheme Development and Accreditation Network (ASDAN) and South Korea’s Lolo Educational Services. In these countries, the HIPPY model will be expanded and transformed to better serve upper- and middle-class populations. Professional teachers will train the parents, with the goal being to bring the children to a higher level of academic success. Israel has been the home of the Jewish people since Biblical times. And since the founding of the modern state of Israel in 1948, Jews worldwide have returned by the millions, helping to build the strong, secure and vibrant Jewish country that we all know today. Jews who move to Israel are said to be making aliyah, Hebrew for “ascension.” Numerous Jewish organizations have made heroic efforts to bring Jews to Israel — from those that airlifted Yemen’s Jewish community to Israel in 1949, to many NGOs today. But did you know that evangelical Christian groups have also helped Jews make aliyah? One such organization is Christians Care International (CCI), which provides direct support to Jews in the former Soviet Union. Since its founding, CCI has helped more than 87,000 Jews from the former USSR move to Israel. The group is led by Executive Director Don Horwitz. Many of the Jews that CCI works with in the former Soviet Union suffer from pervasive antisemitism and endemic poverty. CCI provides essential services, such as psychological therapy, emergency shelter, humanitarian aid and access to Jewish life. And once these Jews make aliyah to Israel, CCI continues to help by assisting them in finding homes, schools and jobs. Old files have revealed the story of a businessman hailed as the “Bolivian Schindler” for helping thousands of Jews flee to the South American country to escape the Nazis. Piles of documents had stood stacked for decades in the headquarters of a mining company formerly run by German Jewish entrepreneur Mauricio Hochschild. In his time Hochschild was vilified as a ruthless tycoon, but when researchers started sorting through the paperwork decades later, they began to unravel the tale of how he helped Jews flee from persecution in the 1930s. “He saved many souls from the Holocaust by bringing them to Bolivia and creating jobs for them,” Carola Campos, head of the Bolivian Mining Corporation’s information unit, told AFP. Along with fellow magnates Victor Aramayo and Simon Patino, Hochschild had his mining company nationalized in 1952 by the Bolivian government. It accused them of plundering the nation by mining its tin reserves for their own profit. But the documents revealed what else Hochschild had been up to. They include work contracts drawn up for Jews from Europe by the mining firm in the 1930s, says the head of the corporation’s archives, Edgar Ramirez. Archaeologist Asaf Avraham, former director of the Jerusalem Walls National Park of the Parks Authority, is a guest of the opening conference of the Knesset lobby to strengthen Jewish ties to the Temple Mount heritage. “The lecture is a continuation of a previous lecture four months ago when I published a finding of writings from a thousand years ago, writings from the Muslim village Nuva next to Hevron, which mentions the term Sachrat Beit El Maqdis, which translates: ‘Rock of the Holy Temple’. According to Avraham this finding which was uncovered months ago “joins with evidence from early Muslim literature which defines the Dome of the Rock as Beit El Maqdis (Beit Hamikdash)”. “I and my colleague Peretz Reuven showed that at the beginning of the Islamic period the structure of the Dome of the Rock was attributed to tradition that clearly drew from the Jewish faith, with the ritual focus of the structure being the foundation stone. The direction for prayer was then facing towards the foundation stone until a very recent time. Paintings from the end of the 19th century show worshipers kneeling toward the Foundation Stone and not towards Mecca. There is no doubt that the original source of the place’s holiness is the Temple,” says Avraham. Olympic medalist Ori Sasson and Yehuda Yitzhak Hayisraeli, a soldier who was critically wounded during the Protective Edge campaign in 2014 will be leading a group of disabled runners from the Shalva association at the Jerusalem marathon this Friday. Yehuda Yitzhak Hayisraeli (25), a combat soldier in the Rimon unit of Givati, is married to Rivka and is the father of two children. In 2014, Yehuda Yitzhak HaYisraeli was enrolled in an elite officer’s training course. Exempted from the fighting, he nevertheless begged his commanders to be allowed to serve his country on the front line. After completing the training course, his request was granted, and Yehuda Yitzhak joined his comrades fighting in southern Gaza as part of Operation Protective Edge. During the fight in Rafiah, he was critically wounded, suffering a near-fatal wound to the head. Shrapnel penetrated his skull, entering his brain, leaving him unconscious for an extended period and rendering him unable to speak.His second child, a son, was born while he lay unconscious in Soroka Hospital and the baby’s brit milah was held there, with his bed moved to be near it, although he did not respond. After many months of unconsciousness, Hayisraeli began to establish contact with his family, who never lost their belief that their son would wake up and recover.